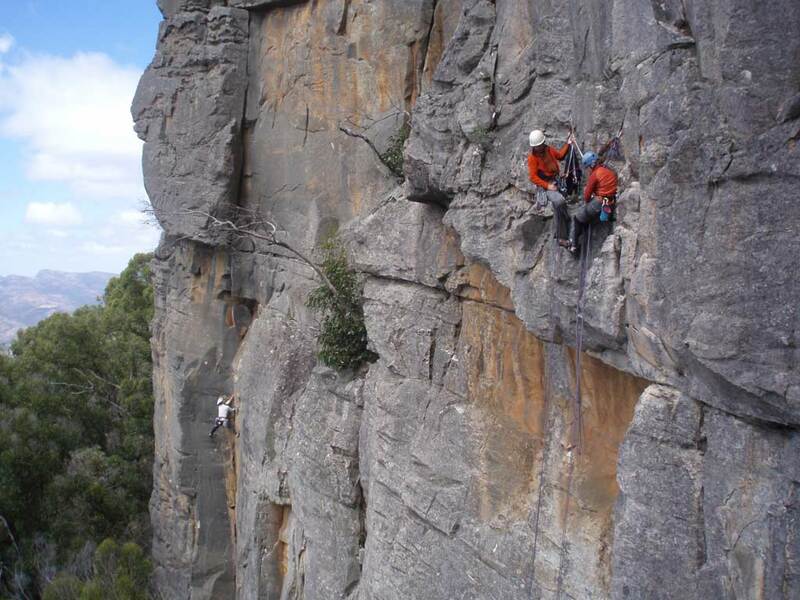 Anyone climbed "The Last Rites" at Mt Rosea? On Saturday the missus and I headed up to Mt Rosea to have a crack at The Last Rites*** (19). We'd previously climbed Debutante without any bother and have recently been climbing a few 20s round the place so thought TLR would be a nice outing. The guide book mentioned it was sustained at the grade but not much else. We climbed it as 4 pitches on a single rope and I thought it was generally OK, albeit with some pretty dodgy patches of rock (hey, that's Rosea) and some iffy pro here and there. However, the little roof towards the top of the first pitch I thought was very very tough and I wanted to know what experience others have had. P1 apparently goes at grade 18/19 depending on which guidebook you read, and the suggestion is you make your way up to a smallish roof and shimmy around it to the right, either by stepping R earlier around an arete, or by climbing right up under the roof and moving right. In either case I thought the moves were a good deal harder than grade 18, particularly given that if you screw it up you'll likely bounce hard off the sloping ledge below you. B) did I miss some crucial hidden hold that makes it a grade 18 pitch? that's funny - I climbed it a couple of weeks ago and had the same experience, except after trying the roof twice I down climbed and crossed the arête earlier and it was back on grade. All the chalk on the line under the roof makes it look like the standard route but on second reading of the guide I think crossing the arête earlier is the original route - could be wrong. Ditto. I remember staying low on the arete and thought it was about right at 18. I only seconded that pitch, but I think my leader got some gear up high and left before stepping down and across - so well protected but some killer rope drag later. We almost crossed paths, we were the party way out left on Saturday, I think my second could see you part of the time. Well there's a damn sight more chalk there now :-) I spent an age under there faffing around trying to figure out if the big, shouldery move out right on zero feet was the go. The only thing to be said for my approach was the gear was good right under the roof but yes, killer rope drag Steve (was that you guys on Tourist Buttress). Sounds like getting round the arete earlier is the trick. You are correct. The original route steps right around the arete below the sloping ledge in the corner. In the Baxter South East Gramps guide Bern Lyons is shown belaying from this ledge on Square route. The first time I did Last Rites (in late 70s) I inadvertently tried to climb straight up to the roof and could find no gear above the old peg on the sloping ledge. Eventually I backed down and went around right and Keith called up "I wondered when you'd work out you were going the wrong way". I think the first person to climb direct through the roof was Terry Tremble in1984. I have now led that pitch 3 times, once via the original and twice via the direct. The direct is better climbing and no harder than anything else on the climb but it is definitely DFU until you reach the roof. * edit * So direct to the roof is prob 19 R to lead. >(was that you guys on Tourist Buttress). No, we were on Dinosaur Gully DF. My second had the view to the north while I was in the corner; it sounded like she was describing a party on TB but I wrongly concluded from your post it was your team. Rosea was popular on Saturday? Did it a long time ago, but I do remember that section feeling a bit dicey, but not to hard. All up, one of the best multi pitch routes I have done! I've updated the description for Last Rites on The Crag. It's getting a bit wordy though. Here's the revised description. If you have any suggestions to improve/clarify it let me know. Fantastic climbing from start to finish. Double ropes really help, especially if you want to run some pitches together. Start: Left facing flake-crack 10 metres right of RIP Corner. 33m (18) Up flake to sloping ledge at 12 metres (manky old PR). There are two ways to go here. The obvious way is to climb directly to the overhang and then step right past it. Good climbing but there is no gear above the sloping ledge until the roof is reached and it may make this pitch 19. The original way is to step right around the arete from the foot of or just below the sloping ledge then up the wall to the lip of the overhang (there used to a peg somewhere about here). Now that the two ways have joined, pull over the bulge (be careful with the flake) onto the wall above the overhang and go up to small stance on right (a large wire flicked up into the corner of the next pitch helps with the belay). An even smaller stance is available a few metres below. 26m (19) Follow obvious traverse line out left for 4 or 5 metres into daunting corner (there are actually 3 corners above this traverse - this is the middle one). Up corner and past a peg runner. Exit left above overlap and up juggy wall to long ledge below overhang. 41m (17) Take the steep left-facing corner left of the overhang until it eases and up crack to top. sounds good, the only comment I have is that the stance for the belay on pitch 2 is left of the roof/flake move, not right. The same mistake is in the old guide. Yeah, I climbed the route with Ross last year. Probably the best multi-pitch that I've done! Simply stunning. I Ied Pitch 1. I just followed the line up to the roof and then went right. It is quite intimidating there at the roof before you go. You have to just trust the grade, traverse right and climb on. I didn't realise there was another option. We'd grade that way 18 .... maybe 19. The standout crux was up higher at the piton. Great moves . I used a small cam there abouts to feel better! The stance at the start of pitch 2 or the top of pitch 2? I've belayed on the right in both of those places. Are you talking about the belay pictured here? that's the one, about 2m left of the flake/roof move, definitely not to the right. The original belay, the one I've always used is several metres above the one in the picture. So the belay on the right is not a mistake. The pictured belay is mentioned but it probably needs to be clearer. OK - Have revised to make the belay options clearer. The lower belay on pitch 1 is probably good if you've got bad rope drag but the upper may be better if you're working a 3 pitch strategy. 33m (18) Up flake to sloping ledge at 12 metres (manky old PR). There are two ways to go here. The obvious way is to climb directly to the overhang and then step right past it. Good climbing but there is no gear above the sloping ledge until the roof is reached and it may make this pitch 19. The original way is to step right around the arete from the foot of or just below the sloping ledge then up the wall to the lip of the overhang (there used to a peg somewhere about here). Now that the two ways have joined, pull over the bulge (be careful with the flake) onto the wall above the overhang. Either belay on a small stance on the left just above the overhang or continue up several metres to a slightly larger stance on the right (a large wire flicked up into the corner of the next pitch helps with the belay here). 26m (19) Follow obvious hand-traverse line out left for 4 or 5 metres to daunting corner (there are actually 3 corners above the traverse - this is the middle one). Up corner and past a peg runner. Exit left above overlap and up juggy wall to long ledge below overhang.